Sequence: Recombinant MMP-19 corresponding to aa Leu99-Ser259 (NM_002429), which comprises the catalytic domain of human MMP-19, with a C-terminal purification tag. Source: Produced in E.coli. Active recombinant MMP-19. Formulation: Liquid. In 25mM NaBorate, pH 9.3, containing 5mM CaCl2, 20μM ZnCl2, 0.05% Brij-35 and 20% glycerol. Activity: Preincubation of MMP-19 catalytic domain at 1.9µM with the broad-spectrum inhibitor GM6001 (Prod No. BML-EI300) at 100nM for 30 minutes only weakly inhibits enzymatic activity (27%). Specific Activity: ≥ 0.40U/µg. One U=100 pmol/min at 37°C using the colorimetric thiopeptolide Ac-Pro-Leu-Gly-S-Leu-Leu-Gly-OEt (100µM; Prod. No. BML-P125) as substrate. Use/Stability: When stored under the recommended conditions, this enzyme is stable at the concentration supplied, in its current storage buffer. Procedures such as dilution followed by refreezing could lead to loss of activity. Scientific Background: MMP-19 is expressed widely, and degrades aggrecan, fibronectin, type I gelatin, and basement membrane components such as laminin, nidogen, and type IV collagen. It is involved in angiogenesis, cancer, rheumatoid arthritis, multiple sclerosis, and psoriasis. 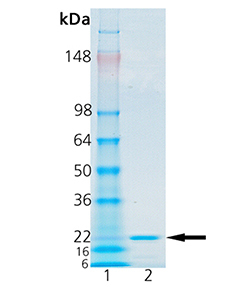 SDS-PAGE Analysis: Lane 1: MW Marker, Lane 2: 0.5 µg of Purified MMP-19 (catalytic domain) (human) (rec.) Prod. No. BML-SE561.